When the Lancia Voyager is used every day, it turns the concept of a simple "means of transport" into an exhilarating travel experience. That is because a "great trip" is not just leaving and arriving, but is instead a continuous string of emotions. A promise that the new model keeps even before getting into it thanks to an exterior style that transmits protection and charm from the very first glance. Here then is a brand new front end featuring the grille emblazoned with the Lancia logo, wraparound front and rear bumpers, rear light clusters with LED light technology, and large headlights with built-in fog lights in the front bumper. The design is up-to-date and finely wrought. The side view offers the classic wheel arch design, while the slim pillars coupled with large windows guarantee excellent visibility. The car is equipped with rails and crossbars on the roof while the tailgate has been redesigned with a modern, functional look in order to optimise access to the interior. 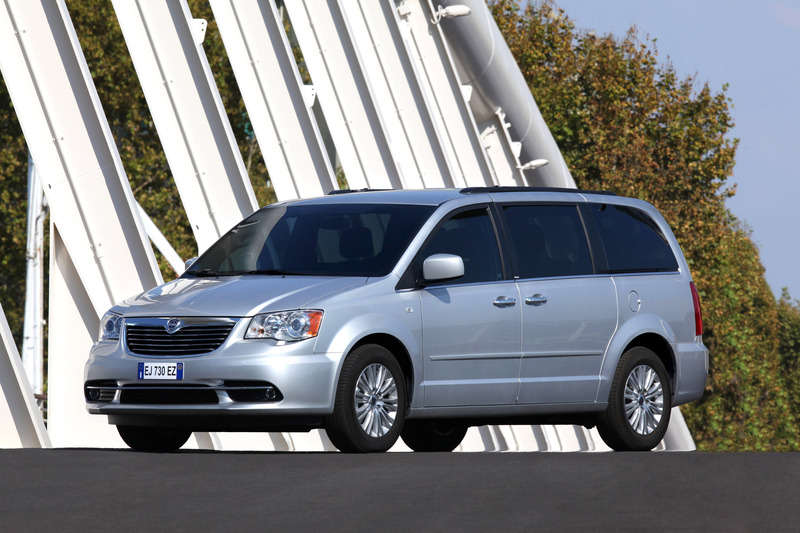 The benchmark in the segment of large MPVs, the Lancia Voyager is 5.21 metres long, 1.99 m wide, 1.75 m high on a wheelbase of approx. 3.1 metres. This impressive size is matched by a spacious, refined passenger compartment in line with Lancia's best tradition, which is distinguished by attention to details and the use of soft materials of superior quality. And it is precisely when the new model welcomes guests that it is at its best. Offered standard in the configuration with 7 seats, it is a model for relaxing moments and comfortable journeys, whose passengers will benefit from a firm sense of on-board wellbeing. To achieve this objective, the designers worked according to the most modern ergonomic standards, in order to fulfil the criteria which measure a vehicle's capacity to meet the requirements for comfort and wellbeing. The final results of the Lancia Voyager are excellent in all key ergonomic areas: comfort, driving position, accessibility, visibility and space reconfigurability. 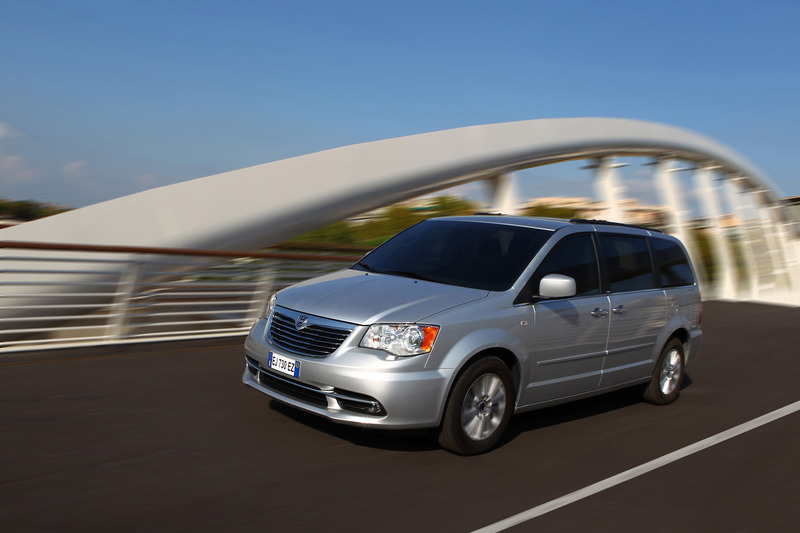 Its welcoming and versatile interior is made attractive by the especially refined, comfortable and snug seats. The front seats are adjustable with electric controls. In addition, the useful "Easy Entry/Exit" function moves the driver's seat into the predefined position, simplifying getting into the vehicle. Comfort and pleasant wellbeing also abounds for those sitting on the rear seats. They are genuine armchairs complete with headrests that ensure excellent comfort without compromising the driver's visibility. One of the peculiarities of the model is the exclusive Stow 'n Go®, the configuration system offered as standard equipment which frees up all the space needed for rear passengers and their luggage, without having to remove any seats. Not only can the seats be folded, but they can be retracted into the floor panel to transform, with utmost ease, the five comfortable seats of the second and third row into an ample load surface, suitable for all travel requirements. If the seats are kept upright, the practical compartments in the floor panel can be used for storage. The Lancia Voyager seats are the best expression of MPV functionality combined with the beauty and luxury of a flagship, as also proven by the presence of heaters both in the cushions and in the backrests to offer a sense of on-board wellbeing. 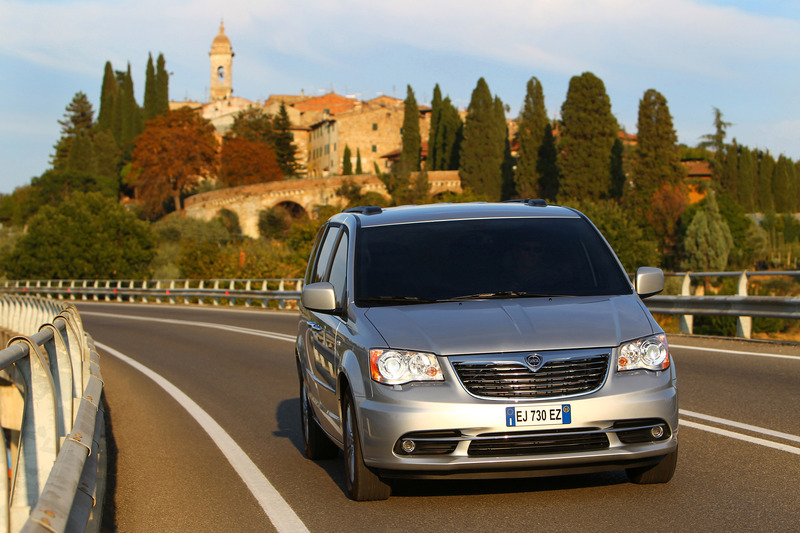 Lancia Voyager surrounds the driver and passengers with technologies that ensure their highest level of acoustic and climatic comfort. This gave us a padded interior, which is comfortable and vibration-free thanks both to the car's super-efficient sound insulation obtained by using new acoustic panels and silencers throughout the vehicle and the adoption of impressive features such as the automatic triple-zone climate control system, the redesigned suspensions and the tyres designed specifically for maximum comfort and safety. 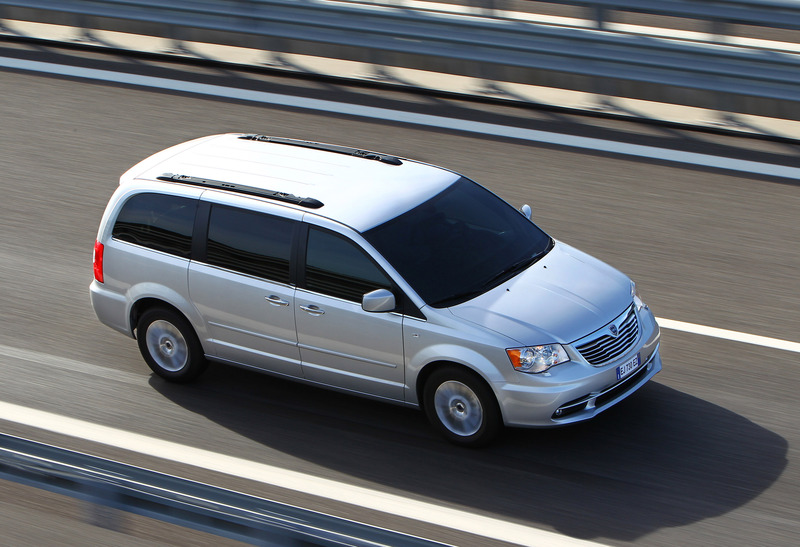 Also the extensive electric roof, the Super Console, the "keyless entry/go" system and the sliding doors and tailgate, all electrically controlled, contribute to the elevated comfort and pleasure of travelling on board the Voyager. Separate mention must be made of the Stow 'n Go® system, which frees up all the space needed for rear passengers and their luggage, without having to remove any seats. Synonymous with uncompromising choice for the driver and also for those who have the pleasure of experiencing it as a passenger, the Lancia Voyager features Uconnect, a sophisticated hub for information and entertainment that manages four main areas: multimedia system, navigation, phone and Internet connection (available via Mopar®). The most advanced statement of "infotainment" level, the device is a complete package that guarantees connection with the outside world and ensures the finest technologies for the driver's comfort and the passengers' entertainment. All in the spirit of maximum safety because the driver always has his hands on the steering wheel without having to take his eyes off the road. Finally, Lancia Voyager offers many devices to really make driving comfortable: from the Cruise Control, heated steering wheel and adjustable pedals to the radio controls on the steering wheel, digital compass and electrochrome interior rearview mirror. The climate inside the passenger compartment is one of the principal factors for comfort when travelling and is also important for preventative safety, because comfort, humidity and ventilation all influence the wellbeing of the driver and therefore his/her level of attention. Not forgetting that the heating and ventilation system is also responsible for the defrosting of the windscreen and side windows. This is why the Lancia Voyager is equipped with a triple-zone automatic climate control system, which allows three different temperatures and levels of air distribution to be programmed simultaneously, at the right of the passenger compartment, at the left and in the rear zone. The system operates by automatically controlling temperature, air capacity, air distribution, the use of the compressor and air recirculation. The vent output positions and speed are automatically adjusted according to input conditions such as exterior temperature, interior temperature, the solar radiation and the coolant temperature. If required, the direction and speed of the air flow can be selected manually and fixed. In addition, the air vent on the floor directs the air flow onto the passengers' feet of the third row, while further air vents for both the middle passengers and those in the third row are present in the head lining. 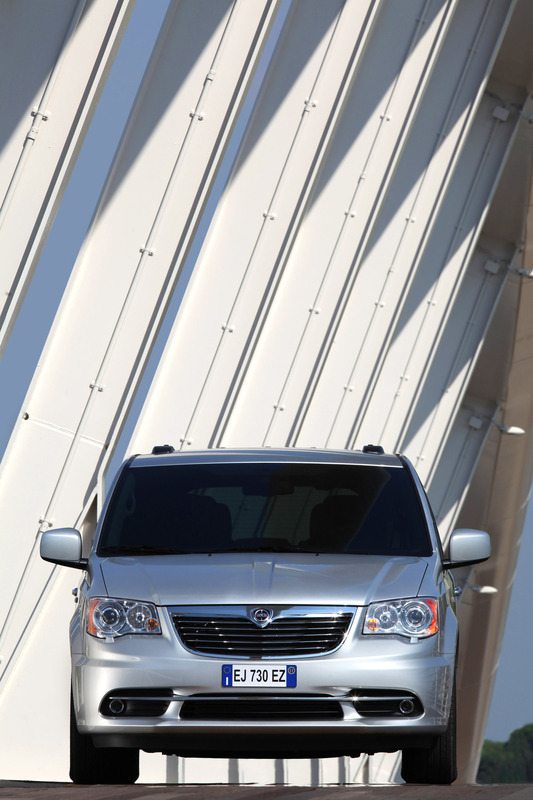 The Lancia Voyager's suspension system uses a solid framework that is optimised to attain the best result in driving comfort and handling terms. At the front, it is the MacPherson type with crossmember and wishbones optimised for new load conditions; at the rear, there is a torsion beam and anti-roll bar to provide excellent handling performance. The Lancia Voyager's suspensions have been specially developed for use on European roads, obtaining both exceptional travelling comfort with all types of road surfaces and handling features, such as precision and immediate driving response, of absolute reference. In detail, the MacPherson struts ensure smooth driving, reactive handling and ultimate noise insulation while the rear axle, with interconnected wheels fitted with coil springs, contributes to improving driving stability and comfort. In addition, the setting up of the springs and shock absorbers envisaged installation of rear shock absorbers with a larger diameter and greater damping and adjustment spring rate control. The height from the ground has also been reduced to give aerodynamic improvement and a more solid and powerful aesthetic form. On request, suspensions with load distribution and height control - so that the distance from the ground can be adjusted according to the combined passenger and load weight - are available, thus ensuring optimum handling and control values. The Lancia Voyager is equipped with premium tyres with less rolling resistance that guarantee a better grip and vehicle response. The designers have also researched the handling features for emergency manoeuvres and obtained improvement in cornering performance and better turning and stability precision. 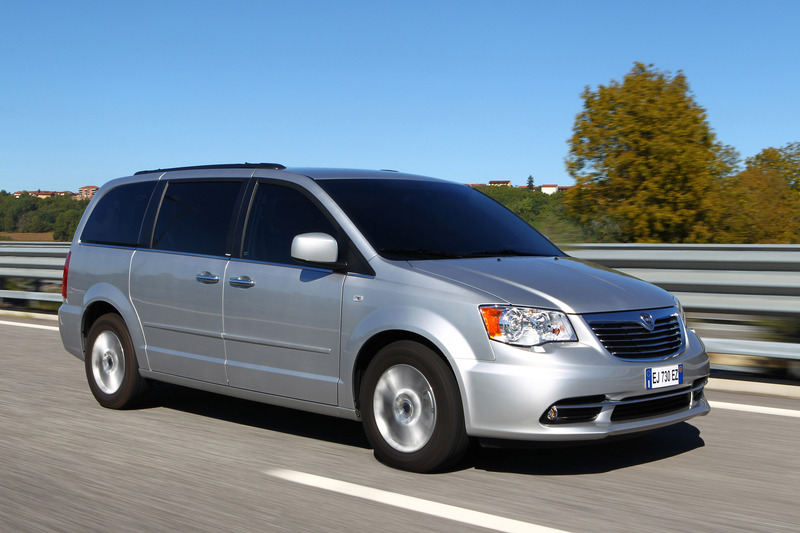 The innovative system patented by Chrysler is composed of two rows of seats that fold away into the floor and practical storage compartments that can be used when the seats are raised. The seats of the second and third row (which can be split 60/40) can bend, tilt and fold away into the floor with simple gestures without removing the headrests. In this way all the surface necessary for transporting luggage and particularly voluminous objects is obtained, transforming with utmost ease the seat zone into a large load surface. Lastly, if the seats are kept upright, the practical compartments in the floor panel can be used for storage. pull the release belt on the upper part of the seat backwards and place the seat in the container, then close the cover. The Lancia Voyager offers the "keyless entry/go" system, making entering your car and starting the engine simple and convenient. You no longer need to search for your key, put it in the lock, turn it, and once in the driver's seat, put it into the ignition to start the engine. All you need is your remote control key and everything changes. When you approach the car and pull the door handle, the keyless entry/go system's electronic control unit checks whether the key is in the vicinity. When the key is located and the secret code transmitted via radio frequency is confirmed as correct, the door automatically opens. At this point, all you need to do is get behind the wheel and start the engine by pressing the button on the dashboard. Once you reach your destination, the same procedure is carried out in reverse. Switch off the engine by pressing the same button, and once out of the car, push the door handle. For the control unit, this is the signal that you intend to leave the car, so the keyless entry/go system locks the doors. The new Super Console includes two 12 volt current sockets within the driver's reach, ideal for mobile phones and digital audio devices. Occupants of both the first and second rows have access to a glove compartment. The front LED cup holders can contain one-litre bottles, while the rear cup holders can be loaded from the first row and then slid back to the second row. There are two storage compartments covered for greater safety. Thanks to the diffused light system on the upper console that contains four storage compartments and adjustable LED lights, it is like travelling aboard an executive jet. There is also a quadrangular rear view mirror that allows the driver to keep an eye on the other occupants. 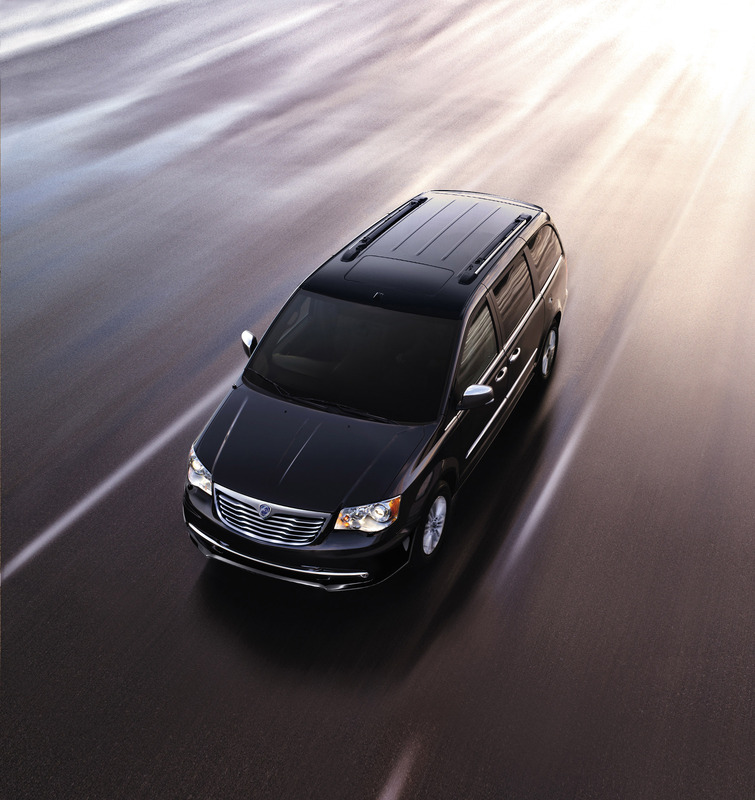 The Lancia Voyager can be equipped with a glass sun roof that lets you have a different relationship with the surrounding environment every time. When you want the passenger compartment to be filled with light, it is possible to have the glazed part closed and the blind underneath open. If, on the other hand, you prefer driving under open skies, it takes just a few seconds to completely open the glass panel and you can enjoy a real "window to the world". All this happens by simply pressing the button on the roof panel console. The roof also has a safety system that reverses glass movement as soon as an obstacle is detected. Again with maximum versatility in mind, the new car features electrically operated sliding doors and tailgate with a safety system for the detection of the presence of obstacles during closure (in this case, the doors are opened again to avoid unfortunate accidents). The innovative Uconnect Media Center offers a touchscreen and voice commands (the microphone is built into the rear view mirror) for easy control of several multimedia sources and outputs. It is also possible to customise on-board multimedia entertainment through iPod® integration and the auxiliary port for MP3 players. The Media Center also includes a modern Radio/CD/DVD/MP3/WMA system and a 30 GB hard disk where music, photos and voice messages can be stored through a USB interface. In addition to the software and navigation maps, the hard disk can contain up to about 6,700 tracks, depending on the model. And for the more demanding customers, a voice message recorder stores reminder notes with a maximum time of three minutes. By connecting a digital device with analogue connection (it supports Mini, 4G, Photo, Nano, 5G, iPodT and iPhoneT peripheral devices) to the USB port located in the storage compartment, you can listen to hours and hours of digital music in MP3 and WMA formats. The audio is played by the car stereo system while the information (artist, track title, album, etc.) are displayed on the radio screen. In addition, the audio peripheral device battery recharges when connected to the USB/AUX connector. Another peculiar feature of the Lancia Voyager is "Uconnect Multimedia", a rear entertainment system with dual LCD screen DVD player for passengers in the middle and back. Specifically, the innovative device enables reproduction of two different media resources at the same time - chosen from many sources (radio, hard disk, AUX input, USB port, two RGB inputs and two DVD players) - on two 9" LCD screens which can be lowered from the roof console complete with remote control and two-channel wireless headphones. In addition, adjustable LED roof lights, inspired by aeronautical design, enable light to be directed only where required. Thanks to the double DVD screen, while one passenger is watching his favourite movie the other can continue to have fun by connecting his video game console. Finally, now available is "Uconnect GPS": the satellite navigation function with 2D and 3D bird's eye view maps and progressive route guidance. It is an innovative hands-free communication system with voice activation that guarantees maximum safety and is simple to use. The voice command system and its full integration with the audio system, with controls on the steering wheel and with the information on the instrument display allow customers who have Bluetooth® mobile phones to use it even if it is in a jacket pocket or a handbag, without ever having to take their hands off the steering wheel (up to 7 phones can be paired up). Therefore, by using the voice commands or the buttons on the steering wheel it is possible to call the numbers in the phonebook (up to 1,000 items can be automatically downloaded from the mobile phone) or answer incoming telephone calls using the car audio system as the microphone (the system automatically cuts out the radio volume). Uconnect Phone is available in 6 languages: English, Dutch, French, German, Italian or Spanish. Lancia Voyager proposes two Euro5-compliant engines which enhance the dimension of travel, with engineering and performance coming together to deliver comfort beyond compare: the lively 163 HP 2.8L diesel and the powerful 283 HP 3.6 petrol engine. Both engines comply with Euro 5 standards and are combined with a 6-speed automatic gearbox with torque converter that offers closer spacing between the gears, limiting engine speed changes between the different transmission ratios and guaranteeing smoother engagements suited to all driving situations. 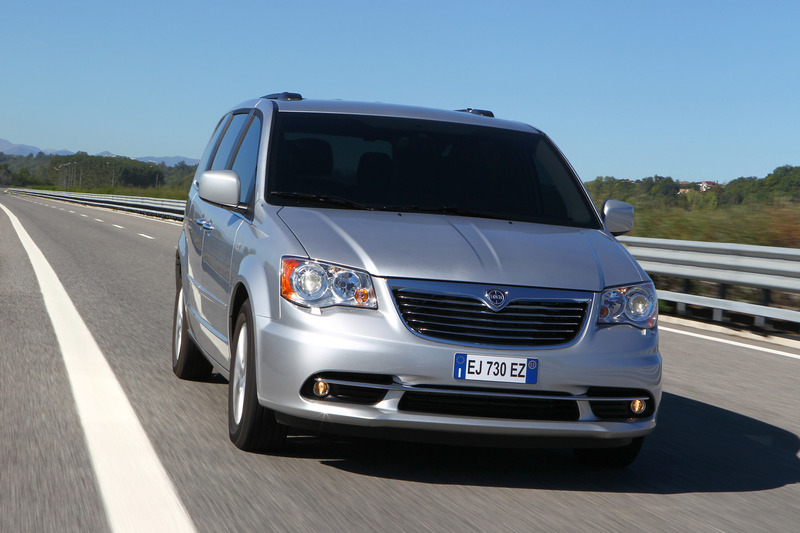 Compared to the four-speed automatic transmission of the Chrysler Group from which it derives, the six-speed automatic transmission of the Lancia Voyager is equipped with two new main gear ratios and a secondary gear ratio to optimize performance at high speeds. It is also designed to increase the torque power on the initial peak to provide greater acceleration when starting off. 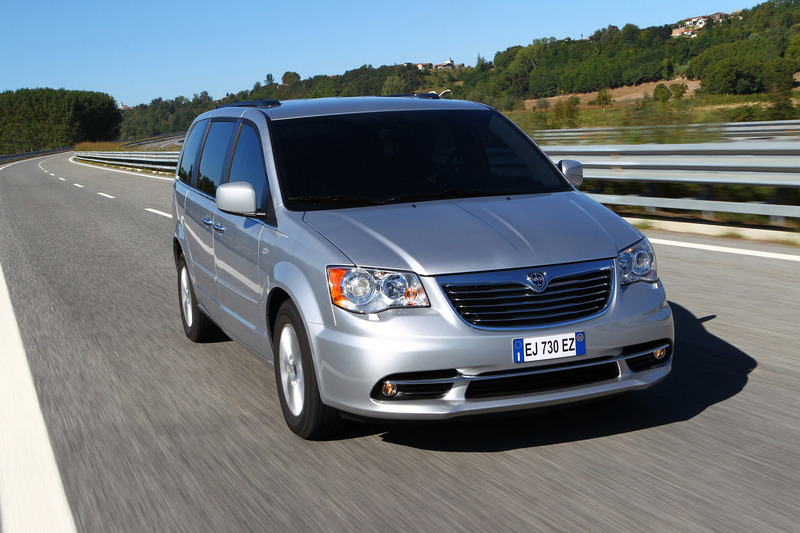 The Lancia Voyager can be equipped with a 2.8 litre common rail turbodiesel engine delivering 163 HP and a torque of 360 Nm, keeping fuel consumption at 7.9 l/100 km in the combined cycle while CO2 emissions are 207 g/km. 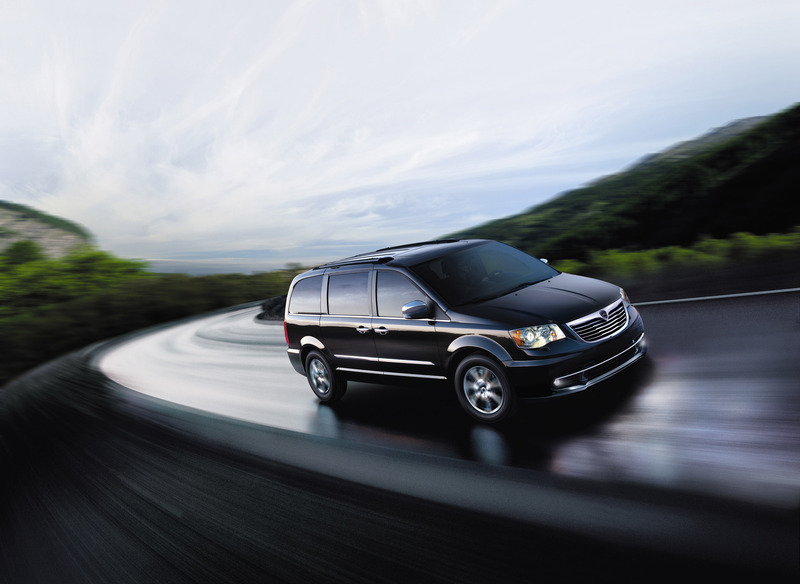 The engine has four valves per cylinder and a double overhead camshaft (DOHC) with belt control. It is equipped with a 1,800 bar common rail injection system, piezoelectric injectors and variable geometry turbocharger. Other features of the Lancia Voyager 2.8L engine are the new intake manifold made of composite material, a new EGR exhaust gas recirculation system, reduced friction O-rings, electronic turbulence control, oil and exhaust gas temperature sensors, diesel particulate filter (DPF) supplied standard and further adjustments to reduce noise, vibrations and rigidity (NVH) and to guarantee improved driving comfort. The second engine in the range is the new 3.6L V6 petrol engine with 6 cylinders configured in a 60° V, which delivers 283 HP at 6,600 rpm and a torque of 344 Nm at 4,400 rpm. Thrilling performance puts it at the top of the class, all with fuel consumption at around 10.8 l/100 km in the combined cycle. Worthy of note is its exceptionally flat torque curve with a high specific power from 1,600 to 6,400 rpm, in addition to passing the peak value of 90%. This means concrete excellent driving and reactivity features for the customer. 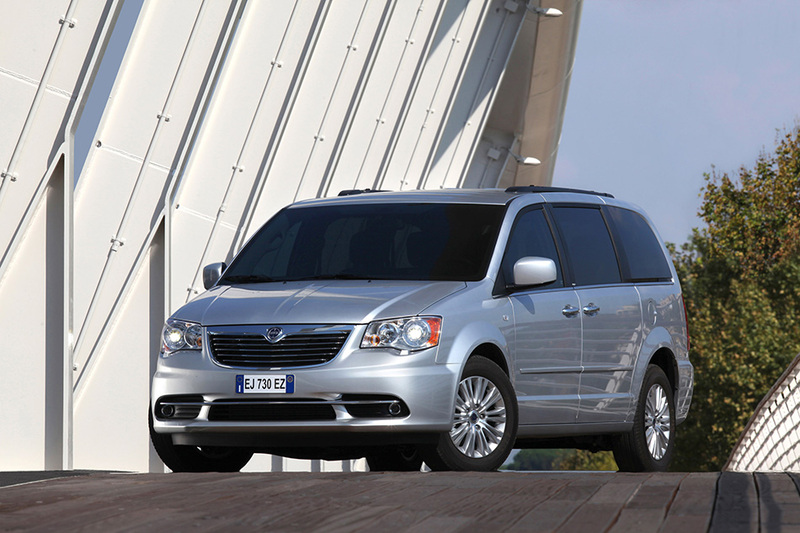 The Pentastar V-6 engine of the Lancia Voyager boasts a completely restyled design, with double overhead camshaft (DOHC), aluminium exhaust manifolds, piston skirts covered with polymeric materials, forged steel connecting rods and the 60° die-cast aluminium crankcase. Thanks to the combination of the high flow intake and exhaust valves with the phase transformer with independent timing of the two camshafts, it offers optimum volumetric and fuel efficiency in the entire load and rpm interval. What's more, the sophistication of the single components was a key goal since the design phase. This goal has been achieved due to using state-of-the-art techniques in computer-aided design. The structural intake and exhaust zones have been designed in order to reduce the noise levels and to attain specific goals regarding perceptible sound quality by exceeding the expectations of attentive and demanding customers. Designed complying with environmental criteria, the Pentastar 3.6-litre V6 engine does not require the use of lead during its manufacturing stages and adopts an eco-compatible oil filtering system with recyclable filter and removable elements that do not cause leaks. In addition, an integrated oil radiator contributes to protecting the environment when the filter element is sent to the incinerators. The use of long-life spark plugs and a direct ignition system with high distribution of energy prolong the life of the components, reducing the maintenance costs. In full observance of Lancia's tradition, the new model offers the best available to date in the technological innovation field applied to safety and protection as the more than 40 devices offered as standard show. Some of them are introduced for the first time in the segment. These include: latest generation multistage airbags for front seats, new side airbags fitted on the front seat, side window airbags for three rows of seats, electronic stability control system complete with braking assistance and traction control at all speeds, fog lights, automatic headlights and active pedestrian protection, blind spot detection system, active headrests, windscreen wipers with rain sensors, ParkSense® parking assistance system, and ParkView® rear camera. The Lancia Voyager boasts excellent braking thanks to the anti-lock disc brakes as standard on the four wheels, besides special structural features that, in the event of accidents, help to keep the passenger compartment intact and to better manage the energy produced: from the crossmember at mid-dashboard to the Dual Phase steel in the internal and external octagonal front bar; from the straight tips of the front bar to the energy absorbing chassis anchoring struts supporting the engine. The front airbags of the Lancia Voyager are fitted with an advanced latest generation multistage system which supplies an opening adequate for the severity of a crash, which is detected by the ECU that manages the restraint systems and the sensors located at the front of the vehicle. The inflation device for the first stage engages immediately during an impact which requires the activation of the airbag. The timing device for the second stage determines whether the supply force required is low, medium or high. If a low supply is sufficient to meet the needs of the situation, the second stage release is delayed in order to eliminate, in the case of a crash, pyrotechnic material activated by the system. To protect the passenger's pelvis and chest when the side of the car is struck, the Lancia Voyager is equipped with side bags which are located inside the backrests, ensuring better protection of occupants, regardless of their stature, the position that they assume and the adjustment of the seats. Fitted as standard on all vehicles in the range, window bags are set up to descend along the windows to protect the occupants' heads in the case of a lateral collision. 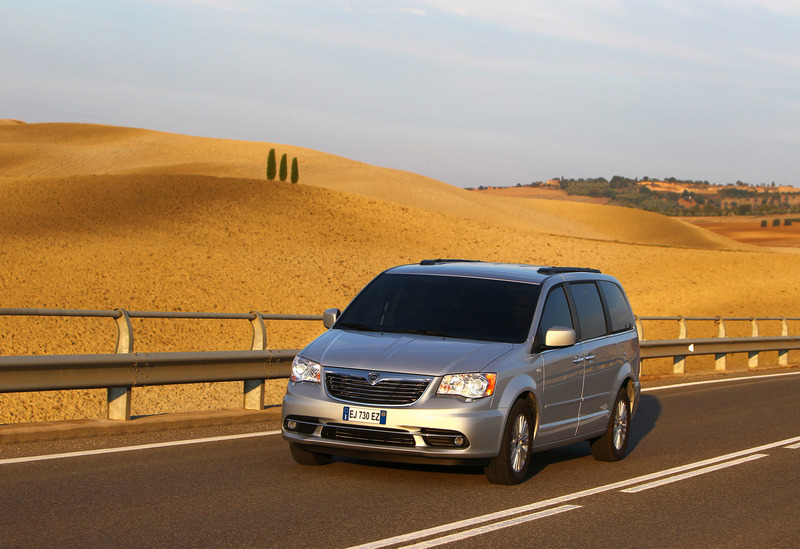 Compared to other solutions, the Lancia Voyager's window bags offer more protection (because they always inflate in the correct position), and are quicker to inflate and less invasive for passengers. They open from the top downwards, with no risk of causing secondary damage to the occupants' arms through their movement. In this way, they efficiently protect both the heads of the front passengers and those seated behind, because they are as wide as the windows. The window bags also ensure that passengers are protected if the vehicle rolls over. The two cushions (one for the right hand side and one for the left) are located under the roof side members, folded into a closed compartment. The Lancia Voyager's headrests are designed to reduce the risk of injury by limiting the head's movement in the case of shunt. The restraint system ECU determines whether the severity or type of rear impact requires the activation of the rear headrests. If their activation is required, the front half of both active headrests extends forward to reduce the distance to the occupant's neck. The Lancia Voyager's front headlamps are automatic (they switch on and off depending on the environment lighting levels) and have a levelling system that allow them to maintain the most suitable position compared to road surface (regardless of the vehicle load). 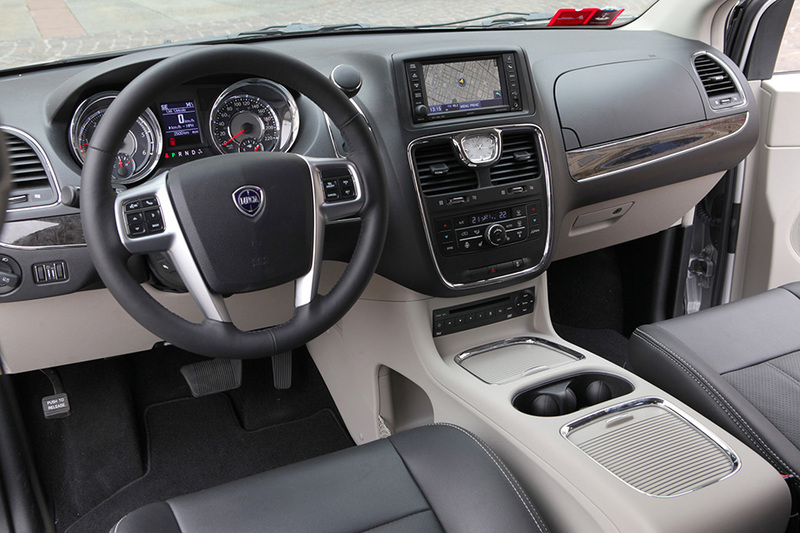 Another exclusive feature of the new Lancia Voyager is the "Blind Spot Monitor" (BSM). This visual indicator on the door mirror signals entry into the blind spot, namely the dangerous situation of having a car travelling alongside which is not visible in the door mirror. When the indicator is used to signal an intended lane change, a visual and audible alarm alerts the driver to check the position of vehicles around him very carefully before manoeuvring. The system intervenes in the event of accidental impact raising the rear of the bonnet in order to safeguard the pedestrian safety. 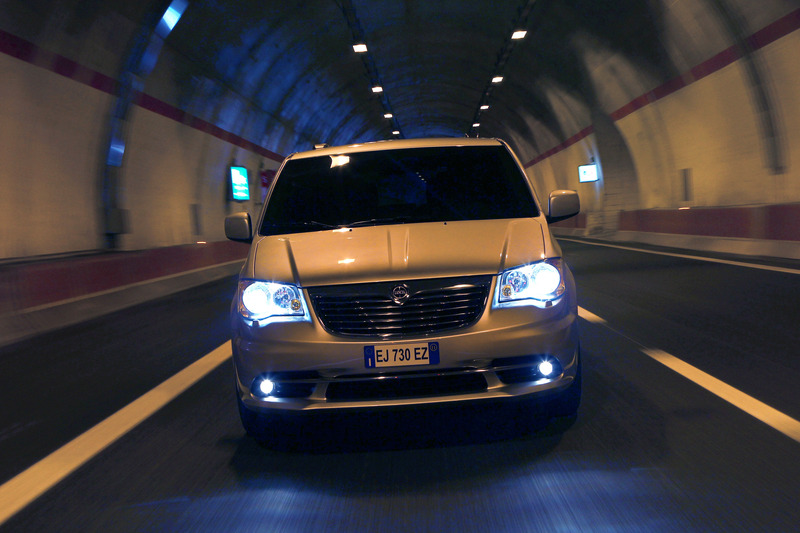 The Lancia Voyager offers two systems that help in parking manoeuvres: the ParkSense® sensors and the ParkView® camera. When parking, it may be the case that there are obstacles behind the vehicle which are outside of the driver's field of vision, or more simply, the driver may not know how close he/she is to the car parked behind. This is where the ParkSense® parking sensor comes to the rescue. It is activated every time the vehicle is put in reverse and at a speed of less than 16 km/h, and transmits visual and acoustic warnings to the driver on the control panel display. The system is formed by an electronic control unit and four ultrasound sensors in the rear bumper that detect obstacles at a distance between 30 centimetres and 2 metres horizontally, depending on the position, type and orientation of the object. 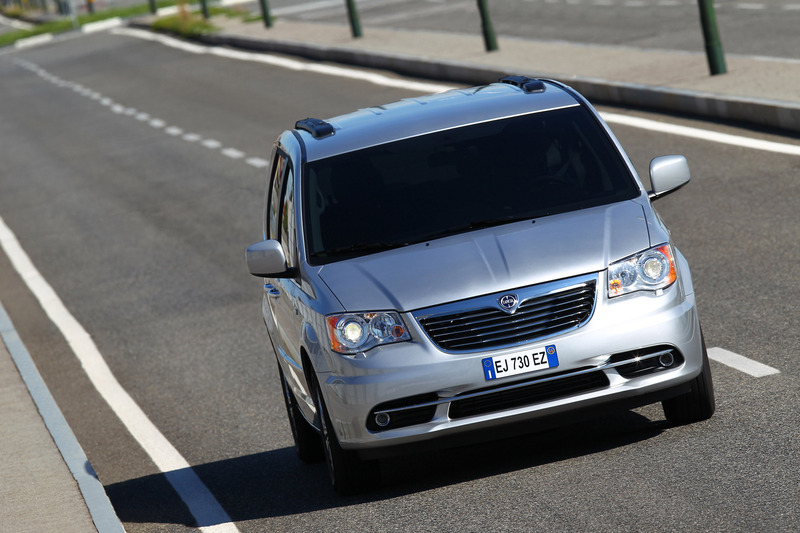 The Lancia Voyager can then be equipped with ParkView®, a camera placed over the number plate that displays a rear overview of the vehicle. When reverse is engaged, the device transmits the image onto the multimedia radio/navigator display, illustrating the width of the MPV and the distance from the rear objects with a static line grill.